Judge Darrow made a written ruling on the most recent mistrial motion yesterday, without even hearing oral arguments this morning. I read it last night and I think it was a big defeat for the defense. Not just because they did not get the requested mistrial but because they didn't get much of anything they wanted. 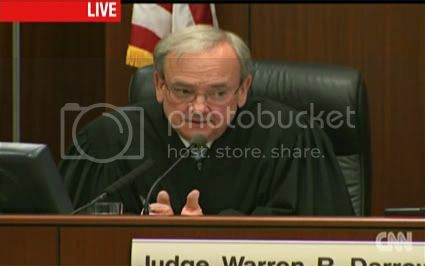 And I'm reading between the lines but I pick up a certain impatience from Judge Darrow, with the defense team. He did preclude Richard Haddow from testifying for the prosecution as requested by the defense. Personally, I don't think the prosecutors were serious about that. I think they were just calling the defense's bluff. They forced the defense to discredit him as an expert and state once and for all that they would not be calling him. Very well played, I must say. Not only did Judge Darrow affirm that the defense will not be calling Haddow, he stated that the defense has chosen not to call another expert on the matter. He also reiterated that they can't cite the Haddow report in a way that doesn't comply with the rules of evidence. Finally, he ruled that there will be no further sanction against the State over this Brady violation, beyond his preclusion as a State witness. So this decision all but completely puts the Haddow matter to bed. Also settled in this ruling, is the matter of the prosecutorial misconduct claim that I described here as their accusing the prosecution of lawyering. He ruled that whatever occasional, leading questions were asked or hearsay evidence elicited were properly dealt with through objections and stricken testimony. Judge Darrow also reiterated his now clear understanding that there is nothing new or novel in the carbon dioxide issue, nor the matter of where participants were seated in the sweat lodge. This means the defense can no longer argue that the State is using Brady material every time they talk about carbon dioxide poisoning, which was largely their basis for this last mistrial motion. Frankly, they looked like fools, arguing passionately that carbon dioxide had never been mentioned and then having transcripts of their own year old discussions of carbon dioxide read to them. The irony of Luis Li repeatedly arguing that the organophosphate theory is part of the State's "own evidence" when the defense has so completely fumbled openly and repeatedly stated carbon dioxide evidence is not lost on me. The former is taken from a snippet of background noise, spoken by an unidentified person, which I do not believe was ever included in a transcript. The latter is the product of direct interviews of State witnesses by the defense and remains transcribed and fully available in the defenses's "own evidence." Still, you kind of have to admire Li for continuing to be so strident on that odd bit of hearsay that the State missed. And that, unfortunately is where I came in this morning. Or, should I say, that's the point at which CNN finally decided to start running the feed of the trial. I'm still not quite sure what they were arguing this morning because I missed the beginning. I just know that Li was really worked up and ranting about how the State has not been "sandbagged" by the organophosphate defense. At least part of the hearing had to do with Dr. Kent's proposed appearance as a State witness; something else the defense failed to notice at the time he was added and fully disclosed on March 14. Funny how the defense keeps getting "sandbagged" with information they have in their "own evidence" so often. Dr. Dickson is a medical witness retained by the State at $400 an hour... and worth every penny. He's an attending physician at Yuma Regional Medical Center. He specializes in emergency medicine and is the EMS Medical Director for that county. He is extremely familiar with heat related illness, having seen a lot of it in Yuma, Arizona. I've been to Yuma... in the summer... and it's hot. He has also seen many cases of hypercapnia, or carbon dioxide poisoning. More interesting, he is, to my recollection, the only medical professional we've heard from thus far who has actually treated cases of organophosphate poisoning -- not many because, as he explained, it's uncommon. But his knowledge of the effects is more than academic. He rather quickly demystified some of the assumptions that have been bandied about the courtroom on organophosphates. He explained that most of the cases he's seen have been amongst farm workers, except for one incident of members of the military who were accidentally sprayed by helicopters treating crops. He also explained that reaction to residential products containing organophosphates is generally mild because the concentrations in home pesticides is extremely low. In other words, he gutted the organophosphate argument. Dickson explained a bit about the spectrum of heat related illness and he placed the demarcation between heat exhaustion and heatstroke at a "change in mental status." In other words, that "altered state" that James Ray was pushing sweat lodge participants towards. Aggressive cooling with cold water and evaporation is the best way to cool a heat exposure victim down, according to Dickson. So hosing people down in the cooling desert air of late afternoon would have been ideal for bringing the temperature down. He did warn that you would need to be careful not to cool patients too quickly because the temperature would drop about 2 degrees every 10 minutes and the victim could get too cold. Thinking back on testimony from people who described themselves as shivering would seem to attest to that. More to the point, it confirms absolutely that the temperature taken by paramedics when they arrived at least 20-30 minutes later would not have reflected the temperatures at the point of injury. Worse, in terms of getting an accurate temperature reading, patients did not have a rectal temperature taken until they were in the hospital. Reading the ear membrane or armpit he described as fairly useless for that purpose because they don't read the core temperature as the extremities begin to cool. For those reasons, Dickson doesn't put a lot stock in measured temperature when it comes to diagnosing heat related illness. He puts a lot more emphasis on other clinical observations and symptoms, such as mental state. Even in cases where people have not been hosed down immediately after exposure, he says that EMS workers are so good at cooling and hydrating patients with IV fluids that the high temperature is long past by the time a patient gets to the ER. He also affirmed that artificial resuscitation will pump IV fluids through the body and rehydrate tissues. Dehydration is not a necessary component of heatstroke. It often happens concurrently because we sweat when we're hot and it can make heat related illness worse, but not all heatstroke patients are dehydrated. So that's another medical professional who has affirmed my own understanding of that. Dickson also affirmed that the humidity level in the sweat lodge would have made cooling the body impossible because, again, perspiration could not evaporate and it's the evaporation that cools the body. Dickson also explained that from the time you click over from heat exhaustion to heatsroke, death can occur in as little as an hour. He explained in fairly graphic terms how the organs can begin to break down, at a certain point irrevocably. He also gave a thorough explanation of DIC, disseminated intravascular coagulation, which is what happened with Liz Neuman. This is where the arteries begin to break down from the heat and the body attempts to plug the holes with clots. This exhausts the body's supply of clotting factors and results in internal bleeding. Much of Dickson's description of end stage heatstroke described what we know of Neuman's situation, including her descent down the Glasgow Coma Scale from 15 to 3, including that people can still speak (and decline to leave a sweat lodge??) even as they are descending towards that deathly 3 where she was when paramedics treated her. Dickson also explained symptoms like frothy sputum and miosis. Unlike others who've testified, he feels that both are conistent with heatstroke and are referred to in the literature. In particular, he put the frothy sputum issue into context. Like Dr. Mosley, he explained it as a common symptom of pulmonary edema, which he said is a late stage finding of heatstroke. He also drew a distinction between that pink, frothy sputum and the drooling associated with organophosphates, which he described as more of a pouring liquid; not foam. Hughes also had Dickson explain thoroughly that discussion of the patients regarding cholinergic and anticholinergic symptoms indicated no clear pattern of either. It was some from column A and some from column B. Both Dr. Cutshall and Dr. Mosley have said the same, though not in as much detail. This rather thoroughly discounts organophosphate poisoning which should have caused a more clear cholinergic poisoning pattern. Dickson does not believe a toxidrome is indicated at all. He also excluded rat poison because there was no evidence of bleeding to death. The only bleeding was in Liz Neuman associated with that DIC which was a final stage. Had it been rat poison, 45 minutes of CPR would have caused death from internal bleeding. And Liz Neuman was hooked up to mechanical CPR for quite some time. Dickson had been provided with the pesticides in question from Angel Valley Ranch, the Just One Bite, JD Eaten, an d-Con rat poisons, all of which would have caused that bleeding death. He also looked into the toxicity of Amdro ant poison, even though it wasn't used until 2010. None of them contained organophosphates. There was a bit more legal discussion after the first part of Dickson's testimony. Hughes's intention of asking him to correlate the symptoms described in 2007 and 2008 with what he knew of heat related illness, drew predictable reaction from the defense. Do argued that it conflicted with prior rulings but Judge Darrow disagreed. 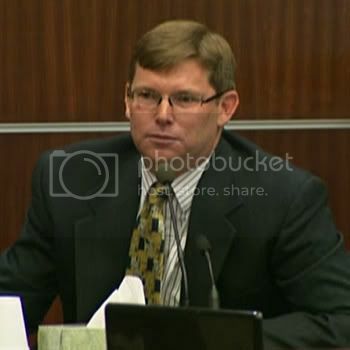 He decided that any testimony that had already been described by witnesses in court was appropriate to run by this expert, as long as Hughes was careful to characterize it honestly and avoid terms like unconscious when unresponsive was more accurate and less suggestive. I don't actually know what questions Hughes may have asked Dr. Dickson about 2007 and 2008 because, once again, CNN decided a line-up of one news feed, weather, nothing, and nothing, was more important. Yes, they would rather have empty feeds than air this trial. 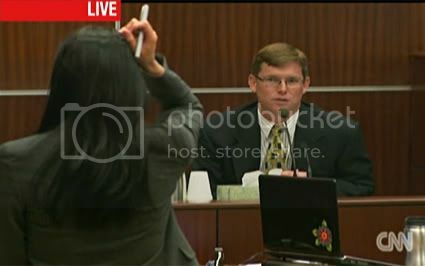 So, I missed the rest of Hughes's direct questioning and the beginning of Truc Do's cross. On the plus side, I think I have a solid understanding of the weather that was occurring across the country this afternoon. All I can say is, keep letting CNN know that their indifference to James Ray trial viewers is not appreciated. I have heard from a number of you that the email address I provided recently kicked back emails as undeliverable. I've used this form several times. I've never gotten a response but who knows. Consider that the html is broken for the contact link on the live feed page and you get some idea of how much importance CNN places on the opinions of its viewers. When CNN finally restarted the trial feed, Truc Do was well into a deceptively phrased Q&A on the harmless chemical constituents of everyday things. Dr. Dickson, by his own admission is no chemist. Even so, Do couldn't get him to concede much if any ground. He admitted that when he received the toxicology report he had to look the chemicals up online. Do spent an unbelievable amount of time establishing that this is not his area of expertise even though he acknowledged that from the outset. And he explained that if confronted with a toxicity in a patient, he would do the same sort of research because he learns primarily through reading. He would turn to the MSDS, as he did in this case, becaus that is the standard of care in his hospital. Basically, he demonstrated that he is very good at researching things even when they're not part of his area of expertise. In his reading he learned that 2 ethyl 1 hexanol is nontoxic and described how rat and human testing demonstrated what we already knew; it's of very low toxicity and any actual toxic effects remain unknown. Do reached instead for the EPA document and, at Hughes's request, it was admitted into evidence and shown on the screen. She gleefully posted the following, seemingly oblivious to the fact that it proves the chemical is a harmless component of numerous products and that it's in our food supply. In terms of pesticide use 2 EH is used only as an inert ingredient. There are currently no registered pesticide products containing 2 EH as an active ingredient. 2 EH is used as a solvent, co-solvent, adjuvant of surfactants, a defoamer and pesticide products used on agricultural food, crops, animals, ornamental plants, and in residential use pesticides such as insect sprays. That, at least, is what I believe the paragraph said. It was hard to make out given her bizarre pronunciations and the obvious fact that she had no understanding of what she was reading. For instance, she followed up by asking Dickson if he knew what an "adjoovant" or surfactant was. He had to explain that it was adjuvant of surfactants; in other words something that assisted surfactant properties. Her response: "What does that mean?" Note to Truc Do: If you're going to try to demonstrate the ignorance of a witness, it's better if they don't understand something far better than you do from the very first cold reading... and if you don't talk like a 13 year old valley girl. Basically, Dickson spent the afternoon schooling Do on things he has only passing knowledge of. Predictably Do brought up the recorded background noise in which we hear the word organophosphates. But Dickson was singularly unimpressed. He explained that having so much of the data in and looking at the big picture, that reference wouldn't change his opinion at all. He also tried to explain to her what theoretical means and that there is a lot that is unknown, "down to the molecular level." She didn't have much patience for it. She preferred the idea that there were things he didn't know and that this meant he was ignorant. Good luck with that. There was an interminable discussion of how he compiled the data for a report for the State which explained his terms by using standard references. Her implication, I believe, was that he was plagiarizing from these documents. He seemed confused because he has just plugging in the data from known sources, eMedicine and standard texts, for information purposes and his sources were transparent. Do asked him about Dr. Ian Paul's report. He had read it, of course. He disagrees with his definition of heatstroke. After reading his report, he took him to mean that there was some "other cause." This clarifies for me that, in fact, Paul's initial report says nothing about organophosphates. Dickson was advised by the State that there is now an organophosphate theory but he didn't associate it with Dr. Paul based on his report. So, with Dr. Paul, it's another case of an expert who "can't rule out organophosphate," not one who has built a solid case around it. Should be interesting. One after another, Do invoked the other doctors who have testified, and misstated their testimony as being diamentrically opposed to Dickson's. That diametric opposition? Dr. Dickson ruled out organophosphates. They said they couldn't. Hardly diametric opposition when you consider that every one of them, except Paul, stated belief to a medical degree of certainty that the deaths were caused by heat related illness. Dr. Dickson explained that medicine is never 100% and every doctor has his own threshold value. He also explained that both heatstroke and organophosphate poisoning are clinical diagnoses because neither can really be tested medically. There are blood tests for organophosphates but, said Dickson, they are famously unreliable. So that's a new wrinkle. If Dickson is correct, and he's the only doctor so far to have treated organophosphate poisoning, the problem isn't just that nothing was tested soon enough. There are no reliable tests. That would make it much harder to rule organophosphates either in or out. But Dr. Dickson has confidently excluded them because there are so many symptoms that aren't at all consistent with organophosphates. He said he had to to look at the big picture and that, in his opinion, says heatstroke. It's all consitent with heatstroke, even the miotic pupils and the frothy sputum. Confronted with the idea that Drs. Cutshall, Lyon, Mosely, and Paul -- the defense's expert who has yet to testify -- that he is the only one who rules out organophosphates, Dickson held firm. "You're an outlier here," Do said repeatedly, sounding more like a Heather than an attorney. "Four doctors against Dr. Dickson. You are the outlier, right?" Medicine by peer pressure. Nice. Dickson: You're telling me, of, telling me about a testimony that these doctors made that they're, you're saying they said all these doctors completely recanted everything that they said in the medical record and said, I'm completely wrong. This is not heat illness. This is not heatstroke. And this is organophosphate. Is that what you're telling me? Do: I don't believe that's what I told you at all. Do: Okay. Well then, explain it to me because from what you're writing here I think it implies that. Ironically, it's actually Dr. Paul who's the "outlier." He's the only one who doesn't think these were heat related deaths. Perhaps when he testifies, the prosecutor should let him know that he can't sit at the cool kids' table if he won't sign off on heatstroke. Do also tried to pit Dr. Dickson against other doctors who had given differential diagnoses, positioning his disagreement with their preliminary diagnoses as assaults on their credentials. Dickson was unflappable. He turned himself to the jury and went into his teaching mode, explaining the problems with early opinions and how they can take you down the wrong path before more of the information is in so you can look at the big picture. But Do didn't give up. She tried to pit Dickson against doctor after doctor, misstating and distorting their testimony as she went along. She was in the process of trying to create a conflict between Dickson and Mosley on the definition of "frank" pulmonary edema -- Dickson tried to explain that she was confusing it with "flash" pulmonary edema -- when Judge Darrow called it a day. Do likes to end her questioning on something she can call a win; when a witness agrees with something, anything she said. She didn't get that opportunity with Dickson today. She looked exhausted and gray by the end of it and Dickson looked like he could go another three rounds. He'll probably get that chance tomorrow. If we're lucky, we'll get to hear all the questions she promised to get to today but never did; all the times she said, some version of, "I understand and we are gonna talk about that." I think she achieved a new personal best on using to that particular dodge today -- probably because she didn't actually understand 99% of what Dr. Dickson said. Hi Pat. Yes. So far CNN is still streaming, if not terribly reliably. Word is that will continue for the time being but it's still not completely clear what's going on. And I agree on Dickson. He cleaned Do's clock. Thank you LaVaughn, great update as always. I am slow, but have come to the realization that many of the pointless cross examinations to date are a concerted effort to delay the trial to the point where the jurors will not be able to continue on with it. Do's cross examination of Dixon was the best example of this--pointless and irrelevant questions that kept being tossed back in her face time and again. The less time spent by Do with Dixon, the better for Ray. Unless you're trying to simply stall, of course. thanks so much for the witty, informative and fun accounts. Fabulous stuff. I'm both sorry and glad about missing so much of this. Glad I don't have to watch Do do her thing, and sorry I missed the Doctor's dismantling of her. In retrospect, there was some sloppiness in the previous Dr's testimony, and it seems this Dr. knows more than they did. "..... Frankly, they looked like fools, arguing passionately that carbon dioxide had never been mentioned and then having transcripts of their own year old discussions of carbon dioxide read to them." You should write the book.